When is the Best Time to Visit Osaka, Japan? Next to Tokyo, there’s no city that encapsulates the modern Japanese urban experience better than Osaka. And while its close neighbour of Kyoto tends to see lion’s share of first-time visitors to Japan, Osaka’s got a lot going for it from world-class street food to some of the best shopping east of Paris. Moving on after Osaka? 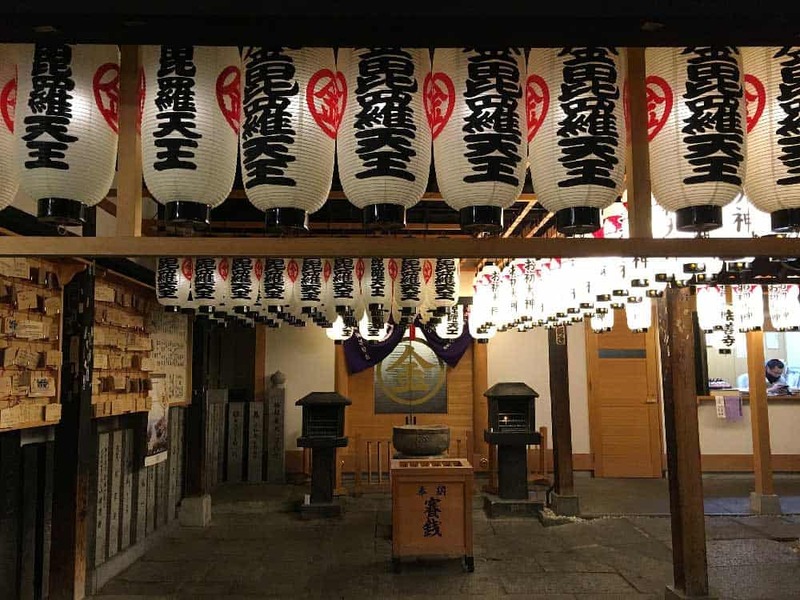 Plan out the rest of your Japan itinerary with help from these guides to the best things to do in Japan in 10 days and the best time to go to Japan! 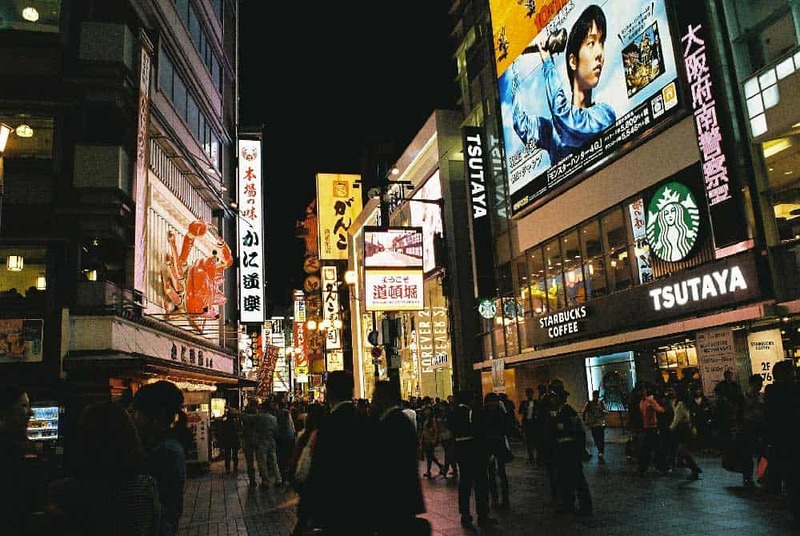 The verdict: When is the best time to visit Osaka? 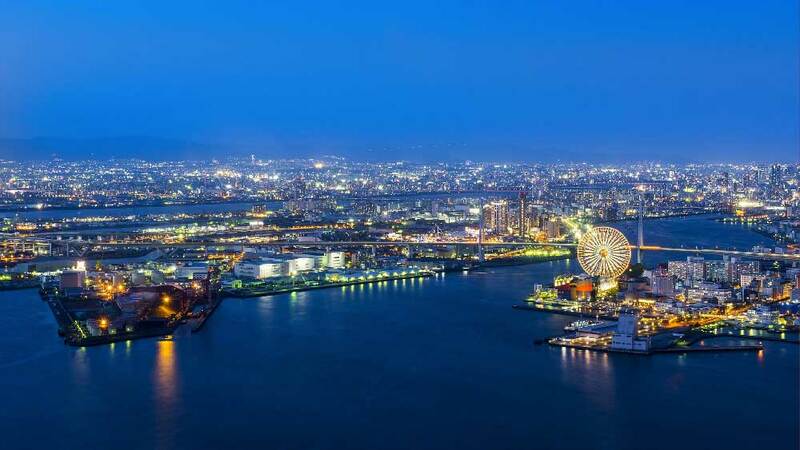 Why visit Osaka in April? Why visit Osaka in November? 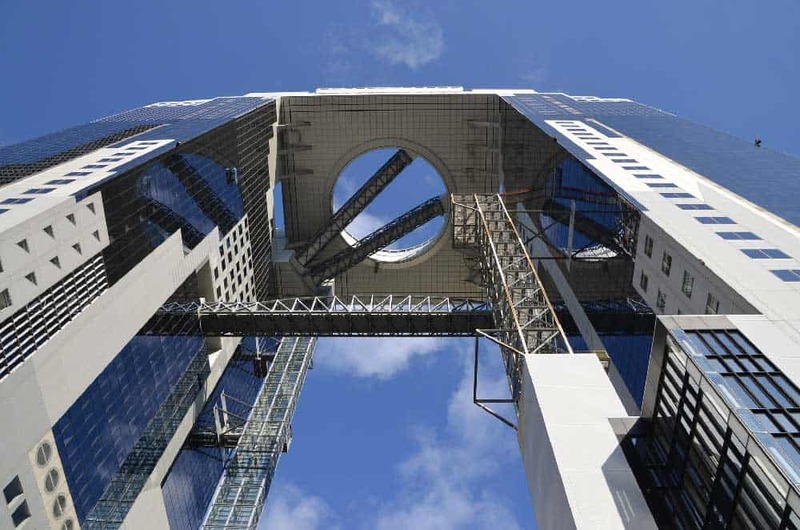 Thanks to its temperate climate, Osaka’s a year-round destination. Seasonal temperature differences in Osaka are marked but not as extreme as in other destinations like far colder Hokkaido or even Tokyo. 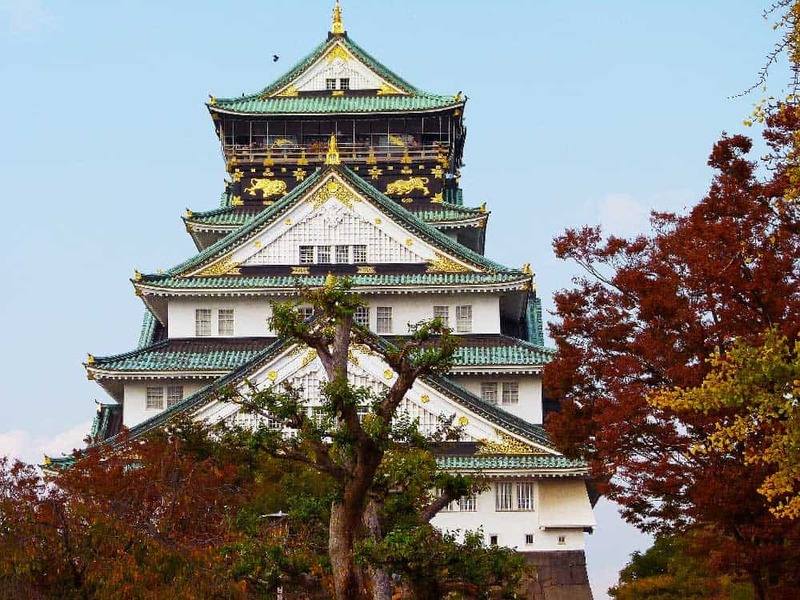 Overall, the best time to visit Osaka is in autumn (October/November) or in spring (April/May). In both of spring and fall, temperatures in Osaka are more moderate than in the more extreme seasons of summer or winter. On top of that, these seasons see Osaka at its best with the spring cherry blossoms and Osaka’s beautiful fall foliage rearing their pretty little heads. Although they’re not ideal times to travel to Osaka, summer and winter aren’t no-gos either. Summer is generally quite hot, humid, and wet. But even in the height of Osaka’s rainy season between mid-June and late-June, rain doesn’t fall every day. You’ll often get to enjoy unfettered sunny days—even if it’s a little sweaty. Winter is likewise relatively comfortable for most travellers. The winter temperatures don’t often dip to the sub-zero lows of Hokkaido or nearby Korea. Ready to travel to Osaka? Don’t forget to protect yourself with travel insurance! 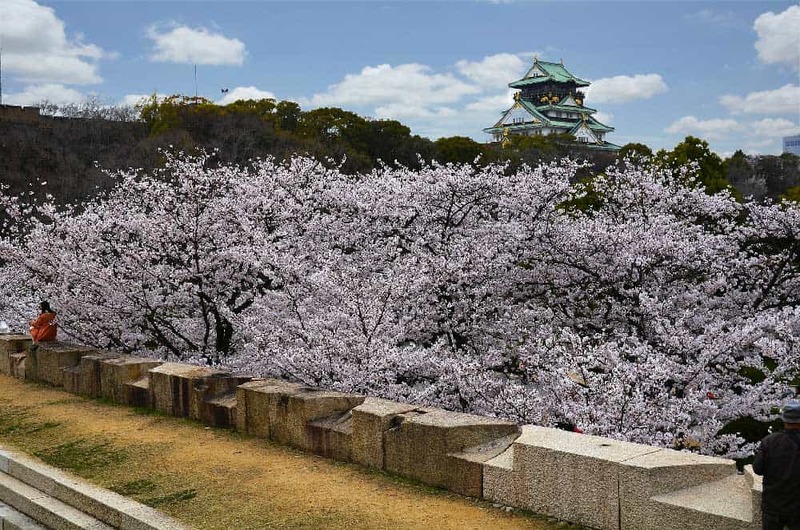 What to expect in spring in Osaka: Spring is perhaps the loveliest time of year in Osaka with the cooler winter temperatures giving way to sunny mild days. At the end of March and the beginning of April, we get our first look at cherry blossoms in Osaka. This season is cherished by Osakans as they shake their winter blues and enjoy the newfound spring life throughout the entire city. What to wear in Osaka in spring: Even with the temperatures picking up from the winter, daytime low temperatures can still be a little chilly into mid-spring. Bring along a warm softshell jacket to stay warm. As always in Japan, it’s a good idea to keep a rain jacket and umbrella handy. Gearing up for spring in Osaka? Stay dry with these guides for the top recommended men’s waterproof jackets and the top recommended women’s waterproof jackets! What to expect in summer in Osaka: As spring comes to a close, temperatures start to heat up coming into the hot summer season. Mid-June sees the first signs of what’s to come as the rainy season begins to rear its head. In general, the summer in Osaka is hot & humid with the worst of the summer rains falling between mid-June and late-July. What to wear in Osaka in summer: With the hot temperatures, you’ll want to dress in lightweight clothing to keep cool. Either shorts or breathable lightweight travel pants are a good idea. Stuff a lightweight waterproof jacket into these top backpacks for day trips for emergencies, even if the morning looks promising. What to expect in autumn in Osaka: Along with spring, autumn is the best time of the year to visit Osaka. Temperatures in the beginning of fall are warm with plenty of blue sunny skies to go along with it. When things start to quickly cool down into October the leaves begin to change along with it, creating classic fall scenes throughout the city. What to wear in Osaka in autumn: In early fall, you’ll often be able to get away with your usual summer wear. As the temperatures begin to drop, it’s a good idea to carry along a warm softshell jacket to keep you toasty outside. September is the second rainiest month of the year in Osaka, so you’ll want to grab a rain jacket to stay dry. What to expect in winter in Osaka: As much as your instincts would tell you to stay away from Japan in winter, Osaka isn’t so bad compared to other Japanese cities like Sapporo. Snow is rare in Osaka although temperatures will dip below zero from time to time. Winter is the driest time of year with plenty of sunny skies to prove it. What to wear in Osaka in winter: In addition to your usual travel garb, you’re going to want to bring along some warmer clothes. A warm hardshell jacket is a smart idea for outdoor activities along with a winter hat, scarf and a pair of gloves. Overview of weather in Osaka in January: As the second driest month of the year in Osaka, expect cool sunny days in the winter month of January. There’s a chance of snow throughout the month, but it’ll rarely stick around for more than a few hours. Visiting Osaka on a time crunch? Maximize your time with this complete one-day Osaka itinerary and our guide of the best places to stay in Osaka! Overview of weather in Osaka in February: The last full month of winter in Osaka, February brings more cool temperatures with (mostly) blue skies to the city. With no major public holidays falling in February, this is quiet time of the year for the Osaka tourist industry. If the cooler temperatures don’t both you, February’s a brilliant time to find some good deals on your Osaka accommodations and airfares. Overview of weather in Osaka in March: The winter finally begins giving way to more spring-like temperatures come March. By mid-March, the plum blossoms start to show up, returning a little colour to the city streets. As the plum blossoms slip away into late March, cherry blossoms begin their reign. The weather in March is, however, a bit of a mixed bag. Expect anything from warm sunny days to cold rainy ones. Overview of weather in Osaka in April: The first true month of spring, April brings warmer temperatures and plenty of beauty throughout Osaka. The beginning of the month sees the peak of the cherry blossom season. This is one of the busiest times of the year in Osaka, but, of course, one of the loveliest. By the end of the month, the crowds have mostly dispersed, making it a more relaxed time to travel. Although April warms up Osaka nicely, there’s still a chance of cool temperatures especially in the evenings. Overview of weather in Osaka in May: Weather-wise, Osaka is quite possibly at it best into the beautiful spring days of May. Temperatures are warm and rainfall, although slightly higher on average than in April, is still miles away from its height during the upcoming rainy season. Although the cherry blossoms are long gone, Osaka’s in bloom with colourful flowers bursting throughout the city. Even with all its positives, Osaka isn’t overly crowded with tourists in May save for the Golden Week during the first week of the month. 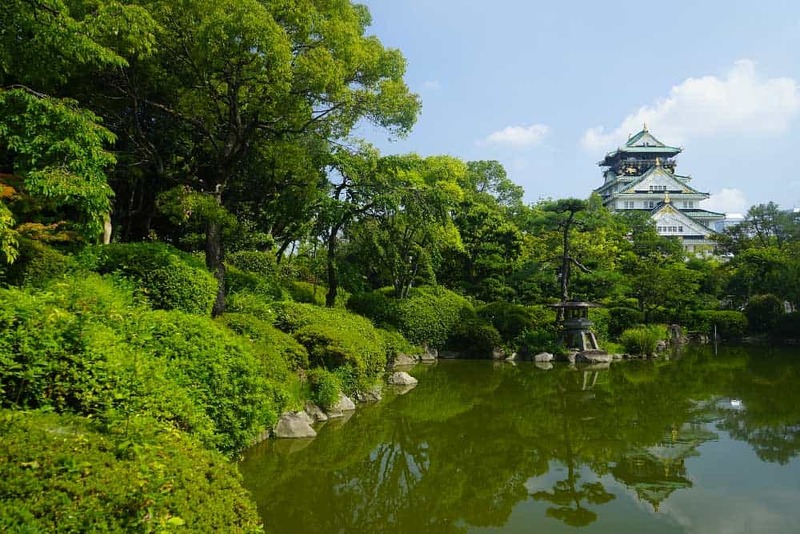 Overview of weather in Osaka in June: The beginning of June is still prime season for sightseeing in Osaka. The crowds aren’t too thick yet and the days are warm without inching into the uncomfortable range. By the end of June things change. With the increasing humidity, rainy season enters to throw a small wrench into your plans. Unlike monsoon seasons elsewhere, however, it won’t rain every single day all day long. Even in the worst of it, sunny skies will roll from time to time for some excellent travel days. Overview of weather Osaka in July: Truthfully, July is a fairly miserable month to visit Osaka. Rain falls regularly until near the end of the month when hot & wet becomes hot & sticky in preparation for the rest of the summer. Overview of weather in Osaka in August: Although the relatively short rainy season is in the rearview mirror, August is hardly a great time to visit Osaka. Most days are sunny, but uncomfortably hot and humid. If you’re used to that kind of thing, however, August isn’t so bad with travel deals abound and fewer tourists to share the scenery. Overview of weather in Osaka in September: As the dog days of summer wind down, September transitions between the hot & sticky summer weather to the warm & sunny days of early autumn. There’s a slight uptick in rainfall at the beginning of the month that dwindles as the temperatures cool. Tourist numbers are relatively low during September. Expect to find some good travel deals. Overview of weather in Osaka in October: Overall, October is one of the best months to visit Osaka. Temperatures are still warm although far more moderate than in the hot & humid days of summer. Evenings cool down offering respite from the heat. Towards the end of the month, the true autumn season ramps up as the leaves begin to take on their fall colours. Overview of weather Osaka in November: To see Osaka among its most beautiful, don’t miss out on visiting in November. The fall season hits its peak in mid-November when the fall foliage explodes into pretty red, orange, and yellow hues. Temperatures in Osaka in November are still relatively warm with very little rain. Along with April, November is quite possibly the best time to visit Osaka. Overview of weather in Osaka in December: The first month of winter, December in Osaka starts out with mild to cool temperatures that slowly dip throughout the month. December is also one of the driest months of the year. Expect plenty of sunny skies. Although crowds are small, keep in mind that amenities might be limited near the end of the month in the days around Shogatsu (New Year’s). The best month to visit Osaka is April or November. April is easily one of the most beautiful times of the year to go to Osaka. The end of March sees the first signs of cherry blossoms in Osaka with their bloom peaking in early April. The weather in April is great, too. Days are continually warming up from their early spring lows while rainfall is still relatively low. If you still find April too chilly, both May and early June offer comfortable springtime alternatives with lighter crowds. If you can’t make it to Osaka for the hanami in April, visiting during the fall foliage season in November is your next best option. By mid-November the fall colours are out in full force in Osaka, painting the city in beautiful earthy shades of red, orange, and yellow. Temperatures into November are still beautiful, only slightly cooler on average than April with less rainfall. For warmer weather (but slightly more rain and no fall colours), October is another great autumn alternative.